"Most of us in the Liberty movement, when we think of Sustainable Development, property rights and Agenda 21 come to mind, and we are well informed on the subject. However, there is more to Sustainable Development that what we have learned. The architects and elite proponents of Sustainable Development, including the policy drivers, are changing what they are saying. It's not that they are changing. They have achieved a stage in the effort. Now, they are revealing their real intent of Sustainable Development. My presentation focuses on the this, from the words of the architects and policy drivers themselves. This includes The Post-2015 Agenda (the 2030 Agenda), the Millennium Development Goals (MDGs) and the Sustainable Development Goals (SDGs) and such. This presentation focuses on what they are getting ready to do because they are currently very active in talking about it! After forty years of socialist indoctrination in schools and LGBT activism, the progressive agenda is finally bearing fruit. Gloating that the Women of the Left and GLAAD were victorious over our country, a recent Rush Limbaugh caller said that our country is in such a mess right now, that Christians won’t even help their own when religious rights are trampled. The warping and destruction of our children’s minds in schools is so complete, they now think the way feminist and LGBT militants want them to think, the caller concluded. The United Nations Sustainable Development Summit will be held September 25-27 in New York and will address Sustainable Development as defined in the 1992 Agenda 21 document after injecting it with steroids and repackaging it into Agenda 2030. It will not address just global warming turned climate change talking points; it will embrace every facet of human life through its 17 goals, a “new universal agenda for humanity” and a blueprint for global governance. At the World Commission on the Environment in 1983, Gro Harlem Brundtland, Vice Chair of the World Socialist Party, introduced the term and the definition of Sustainable Development. “Development that meets the needs of the present without compromising the ability of future generations to meet their own needs.” Who decides what the needs of each person are and the ability? Sounds like collectivism to me. 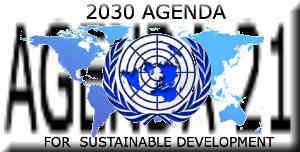 Blueprint of the New World Order Sustainable Development (SD) is not what the actual words imply. SD is a euphemistic tool to create the new international economic order based on socialism after the overthrow of capitalism and the elimination of national identity and borders. SD is a vehicle to construct a one world government, the New World Order as printed on our dollar bill, Novus Ordo Seclorum. I. End poverty in all its forms everywhereI have heard this promise before under communism. We were all on government subsidies and subsistence level standard of living, no proper healthcare, no cars, no homes, drab concrete cubicle housing, few personal possessions, no private property, dependency on mass transportation only, no mobility outside of the city except to commute to work. Poverty will not end, citizens of all races and creeds will be dependent on welfare, food stamps, housing, and poor medical care and drugs. Schools will teach global citizens how to remain perennial victims on the dole because government is the only entity that protects them. Trillions of dollars later, the war on poverty in the U.S. has created generational welfare dependency. Developed world money spent on poor nations increased the wealth of the elites in power. Progressivism will finally succeed in installing global socialism under the umbrella of U.N.‘s Agenda 2030, dressed as Sustainable Development and Equality. His Holiness Pope Francis will come to the U.S. on September 22, 2015 to convince Congress that climate change is the biggest threat to our existence. His visit is a heavenly-sent gift, 3 days before the meeting in New York, which is retooling Agenda 21 into Agenda 2030.